Raised height equipped with adjustable backrest inclinations, provides sleepers the option to sleep or sit comfortably with extra cushion and easy access. 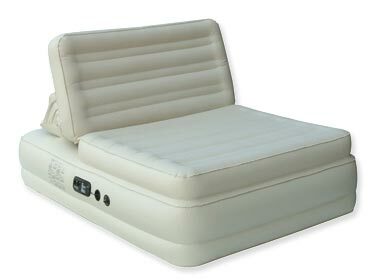 This air bed comes standard with a built-in extra powerful air pump that provides for quick and easy inflation/deflation. • Features SecureAir System ™, this new structural design is engineered to prevent overnight PVC stretches and air leaks.